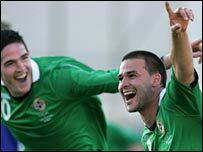 Northern Ireland moved second in their Euro 2008 qualifying group after a comfortable win in Nigel Worthington's first game as manager. David Healy was again the talisman with two first-half strikes. Healy headed in the opener from Keith Gillespie's cross before netting his 31st international goal with a superb curling effort from 20 yards. Kyle Lafferty's powerful shot made it 3-0 while Liechtenstein striker Mario Frick scored a late consolation goal. Fulham forward Healy dragged a first-minute shot wide before netting with his next chance four minutes later. Tenacious work from Lafferty provided the space for Gillespie to send in a pin-point cross with Healy directing the ball inside the near-post. Northern Ireland made a bright start but were given a scare on 18 minutes when Mario Frick was left free eight yards out but the striker sent his header too close to Maik Taylor, who collected at the second attempt. Lafferty should have doubled the lead after 31 minutes but the Burnley teenager managed to head wide at the back-post from Chris Brunt's cross. Healy showed how to finish three minutes later, intercepting Michael Stocklasa's slack free-kick before curling the ball from 20 yards beyond a motionless Peter Jehle. Worthington's men continued to press to half-time and there was no change after the interval as N Ireland went in search of another goal. The third was another classy strike - the returning George McCartney sent in the perfect centre for Lafferty, who made up for his earlier miss by controlling the ball before drilling low and hard past Jehle from 10 yards. Gillespie was having another sparkling game on the right and Fabio D'Elia could only stop the Sheffield United winger with a rash challenge which resulted in a booking. Warren Feeney replaced goalscorer Lafferty with 15 minutes left as Worington freshened up his attack. Steve Davis wasted a good opening on 81 minutes when he volleyed over after the ball slipped out of Jehle's hands. Frick netted with a just a minute left, his initial shot cleared off the line by Stephen Craigan but he pounced on the loose ball to smash low into the net. Northern Ireland: Taylor, Duff, Baird, Craigan, McCartney, Gillespie, Clingan, Davis, Brunt, Healy, Lafferty. Liechtenstein: Jehle, Michael Stocklasa, Martin Stocklasa, Telser, D'Elia, Polverino, Ronny Buchel, Daniel Frick, Biedermann, Rohrer, Mario Frick.